Finally, there is movement on the board. ‘I…will…teach…you…fear…’ the hostess reads aloud. Things are not right in New York. The Ouija board spells out a terrifying message for the partygoers, and that is just the beginning. Something sinister is stirring; when dead bodies marked with strange symbols begin surfacing, Evie and her uncle are pulled into the investigation. What could be killing New York inhabitants in such an frightful way? Is there something darker at work than a simple murder? Evie thought New York would be a breeze-she was sent away from her boring hometown to live with her Uncle Will in New York. Evie was excited-the city lights were practically spelling out her name. The speakeasies! The shows! Jazz! However, it’s not all she hoped-Will is the curator of The Museum of American Folklore, Superstition, and the Occult, or the “Museum of Creepy-Crawlies”. Because of his expertise in the subject, Will is needed to consult on the murder cases, and Evie finds herself in the middle of the investigation. Forget shows, short haircuts, and flapper style-now Evie’s life consists of curses, secrets, and racing against time. Will Evie and Will be able to find and stop the killer before it is too late? This is one of the rare 500 + page books that doesn’t feel like one at all. Libba Bray’s Jazz Age New York is full of music, bright lights, and carefree hearts-until the murders begin, at least. The supernatural elements to the plot are sure to delight fans of the paranormal, while the 1920’s setting adds interest and prevents this from being “just another scary magic book”. Scary? Yes, absolutely. But it’s the very best kind of scary: eerie, suspenseful, and fresh; you’ll be checking over your shoulder and wondering about old curses as you read. 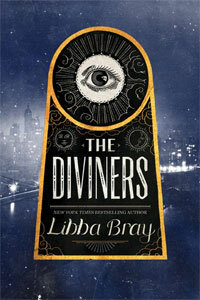 Libba Bray not only brings us a great historical setting, she also gives us characters that feel like real people. This winner of a book combines ancient prophecies, Broadway lights, jazz, and murder, all told by a master storyteller. Bray, Libba. The Diviners. Little, Brown: New York, 2012. 578 pp. Ages 15 and up. Posted on July 15, 2013 July 15, 2013 by ShannaPosted in Ages 15 and up, Ghost Story, Historical, Horror, Multiple Voices, ParanormalTagged 1920's, Jazz Age, Libba Bray, New York, paranormal fiction, supernatural fiction.